Do you have questions? Need a band for an event? Click here to contact Karmann Powell. Joe Bethancourt's Memorial Concert at the Musical Instrument Museum. Click here to view jewelry by Darrell Stackhouse. The Relevant Christian Magazine. Joe is our lead guitar player. Click here to visit the NVCC's web site. 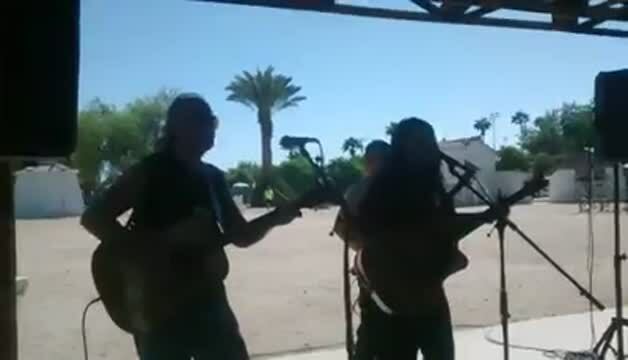 Karmann and Kompany at the Glendale Folk Festival 2016 playing Karmann Powell's original song, Don't Dance With The Devil. Our thanks to Annie Fox for taking the video! "High energy, monster vocals, sacred and secular." Click here to listen to tracks from Karmann and Kompany's Christmas CD, "Let's Celebrate Christmas Right!" Click here for Karmann and Kompany's "Gig" page! Click here to download "Let's Celebrate Christmas Right"